With the NCAA Final Four coming to the Twin Cities this weekend, it seems appropriate to have our own little March Madness Tournament. 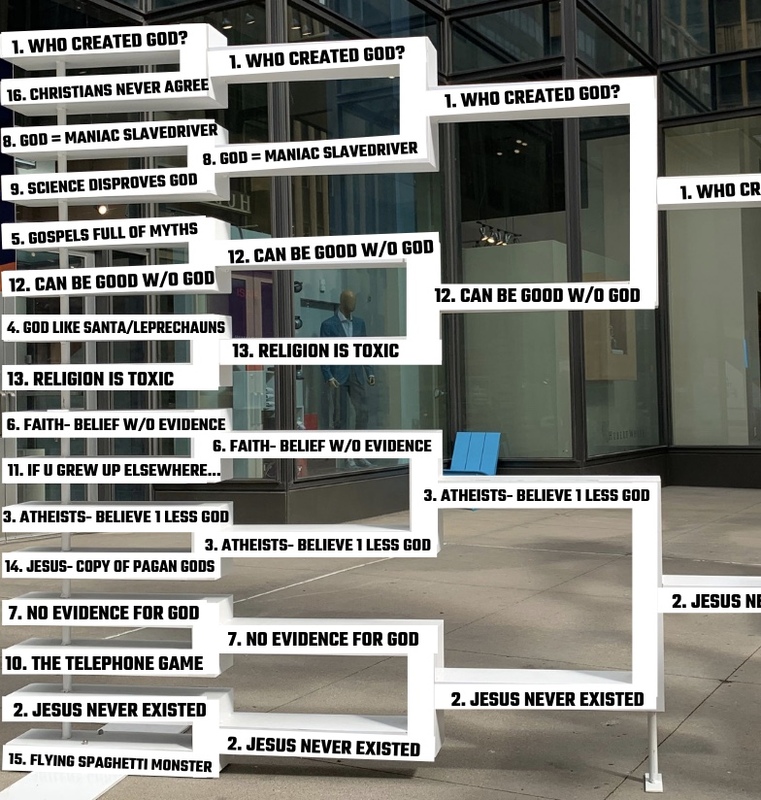 Instead of college teams, we built a bracket with some of the “top” bad Atheist arguments. Below we list 16 of these bad arguments, and list at least one problem with the argument for each. Much more could be said for each of these arguments, so we present this post with the risk of coming across shallow. The point of the post, however, is not to give you a thorough response to each argument - It’s to give you ideas for an initial response to them. For each of the arguments, we give an example question you can ask to better understand where the person who gave the argument is coming from. The goal is to listen and understand, rather than to dominate and tear down. Now that we have the those precursors set, here are the 16 bad Atheist arguments and how to respond to them. Argument #1: Who created God? This question is asked under the assumption that God needs a creator. This assumption misrepresents the Christian understanding of God, where God is the necessary cause of all creation. Question: Why do you think a Christian would say that no one created God? This objection flies against the conclusions of almost all scholars invested into Biblical and Roman history, along with evidence from both the New Testament books and extrabiblical sources. Question: How did you come to the conclusion that Jesus never existed? Some Atheists try to use this argument to show that there is not much of a difference between them and Christians. After all, Christians are "Atheists" for thousands of gods from other religions since they lack belief in those gods! The problem is, there is a huge difference between a Theist (such as a Christian) and an Atheist. Theists believe in a supreme, personal creator of the Universe. Atheists don't. This difference has huge implications for how each carries out their lives. Question: Do you think there are any major differences between Christians and Atheists? Argument #4: Believing in God is like believing in Santa or leprechauns. This statement calls God “made up”, equal on the level of something like Santa Claus. But the Christian claims to have evidence for God, and hardly no one claims to have evidence for a real Santa. The alleged evidence for God cannot be simply dismissed with this silly statement. Question: Do you think there is any evidence for the existence of God? This objection completely ignores the definition of a myth in ancient literature. A myth looks back at the past to understand how something in the present came to be. The gospels were written as a historical narrative, discussing things that were happening at the time. Question: What do you mean when you use the word “myth”? This definition of faith is a clear strawman of the Christian position. Most Christians view faith as involving some sort of personal trust. The trust aspect of faith is simply ignored by the “no evidence” definition. Question: How do you think Christians would typically define “faith”? Christians claim to have philosophical arguments for God’s existence. It seems like those arguments could provide at least a tiny bit of evidence for God, even if an Atheist doesn’t consider the evidence close to satisfactory. Atheists who use this phrase are overstating their case. Question: What type of evidence would you need to see in order to be convinced that there is at least some evidence for God? The idea here is that God is some sort of dictator who tells us what to do and believe and threatens to send us to hell if we don't listen. But this characterization of God contrasts from the understanding that God offers a choice for us to escape the "slavery" of sin and to experience life as it was meant to be lived. Question: Do you think God gives us a choice in how to live our lives? This is one of the most broad arguments in the list. There are many fields in science, and some concepts about God are completely unrelated to those fields. What exactly is being said here? There needs to be more detail given before any substantial discussion can take place. Question: What is one way in which science disproves God? The story goes… You know the game of telephone? You start with a sentence and then it gets changed after being passed down from person to person? Well, that’s what happened when stories of Jesus were passed from person to person. This objection does not take into account the communal aspect of oral tradition - people could check their stories against one another. The objection also causes the reliability of all ancient history to be called into question. Question: How might the way stories were spread in ancient history be different than the game of telephone? This is one of the most common objections to Christianity - if you grew up in a middle eastern country, you would be a Muslim, not a Christian! While this concept does have some truth in it, it packs a load of unsupported assumptions. It also has little effect on the question of if God actually exists or not. Question: How do you know I believe what I do because where I grew up? This statement is true in the sense that people who do not believe in God can make choices that are moral choices. But the statement ignores the grounding of the good - the question of what caused the existence of objective moral duties. Question: I agree that Atheists can do good things without believing in God. But what caused “good” and “bad” to exist in the first place? The idea here is that religious thought always motivates actions that are bad. One problem with this idea is that “religion” is a broad term. It puts people who follow all kinds of religions under one umbrella, even if the differences between those religions are stark. It also downplays any potentially “good” actions taken under religious motivations. Question: Are you referring to one specific religion, or are you saying all religions are toxic? This argument seems powerful on the surface as Atheists stack up similar traits between Jesus and pagan gods - “born of a virgin”, “resurrected”, “born on December 25”, etc. But when you dig deeper into the primary sources for the pagan gods, you will find that the traits don’t align with the actual stories of those gods. Question: Which god is Jesus a copy of, and how do you know that? New Atheists intended to make a point by bringing up this fictional creature - that you could assign the attributes of God to any random thing. But many Atheists who mention the creature now seem to do so in order to mock religious ideas rather than make a substantial point about them. Overall an Atheist who brings the creature up today ends up looking more ridiculous than thoughtful. Question: What relevance does the Flying Spaghetti Monster have to what you are saying about God? The argument goes like this: Since Christians always seem to disagree about everything, it’s clear that God isn’t involved in the whole process. This argument is incredibly broad and immeasurable - it is uncertain how much agreement there would need to be before the objector no longer sees a problem. It also ignores that “mere Christianity” - the divinity, death, and resurrection of Jesus Christ - is almost entirely agreed on amongst Christians. Question: How much agreement would you need to see between Christians in order to no longer consider this objection a problem? Hopefully this list gives you a better idea of how to respond to these bad arguments when they come up. We’re hoping that the Final Four also comes to the Twin Cities next year so we can do something like this again. At the very least, this was fun.